Above me white puffs of cloud swirl in and out of blue skies. They coalesce out of nothingness, dance and paint the blue sky canvas with strokes that I want to last forever only to evaporate into an astonishing clarity. Darker and heavier counterparts mingle about the summits, the obscured peaks only hinted at by sharp, rocky, snow covered ridges rising into an enveloping shroud. Egyptian vultures glide below us, circling, now rising, riding thermals as if scouting the possibility of a new meal. With nary a flap of their wings they soar onward, riding the afternoon air currents up and out of the Shalang Valley. Camp Four of the traverse is on a small rocky outcropping midway down a steep, snow covered, glaciated slope. This snow covered perch along a distinct ridge provides the only “flat”, campable ground for thousands of feet. 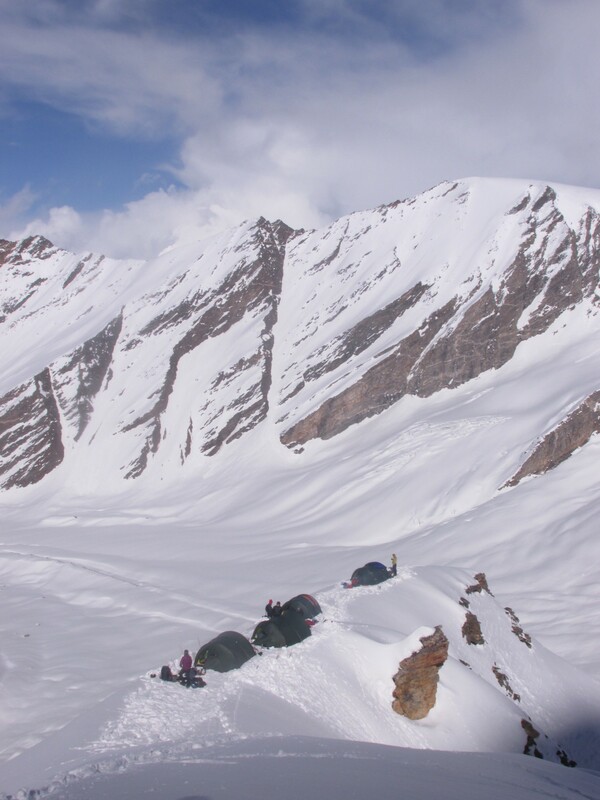 The ground outside our recently erected tents drops away hundreds of meters to glaciers, cliffs, and snow below. It is the most spectacular campsite I have ever had the pleasure of camping at while working for NOLS. It is likely the most exposed and dangerous one as well. Luckily for us, the slope above camp was covered in friendly, plunge step-able snow. Up the slope above camp our tracks rise into the clouds and beyond to 18,400′ Dhana Dura Pass. The benign cotton balls shrouding the pass now do little to recreate the “full conditions” we encountered at the day’s and indeed the course’s, physical high point. We left Camp 3.5, a mere 200 feet below our crossing point, at 0915. Jesse led out of our perimeter after a snow delayed start. Visibility had improved significantly by three hours after the initial 0500 weather check, so we packed up, roped in and made slow moves eastward. Midway up the gully and about 20 slow minutes out of camp her post-holing reached epic proportions. The chest deep wallowing offered little hope of continued upward progress. Later she would reflect, “I kept thinking ‘there’s got to be a better way.’ I looked left and right” she said with a laugh and a smile. “Of course there wasn’t” she continued. The hardest part though, was still to come. Steep, loose rocks with thin snow cover proved to be the crux. “At least I wasn’t post-holing anymore” she quipped. Dropping the cumbersome and heavily laden pack proved to be the ticket to the ridge top. After establishing a solidly positioned sitting belay just below the crest, Robin and Brenna followed with significant difficulty. After a short pause, word floats down “get your ascenders out.” Back within the safety and convenience of our perimeter which my rope team had yet to leave, I helped my rope team rig their systems. Above, the two other rope teams dropped packs, grabbed ascenders and rigged them as they paused, all thirty meters apart, on the steep slopes. At the ridge top, Jesse attaches a rope to herself, hucks it down the hill and sits down. “Line’s fixed” she yells down and gives a few directions to following rope team. Despite the earlier clearing trend, conditions slowly deteriorated as we ascended and by the time we were moving again the winds had picked up and visibility was back on the decrease. Forty-five minutes of forgiving, if not painful, plunge stepping later had the skies, above and below, clearing. Below us the group was slowly congregating on the precipitous Camp 4. Awe inspiring to say the least. We descended slowly, with Robin, Jesse, and Brenna right behind, and joined the rest of the group. We plop on our packs, but not before our swiveling heads and turning torsos combined to take in the soaring ridges and peaks that surround us in almost three dimensions. Crevasses, icefalls, and fluted snow slopes rise out of the Shalang Valley, culminating all around while out the valley to the northeast rise the snowy, jagged peaks of Tibet. Then with a quick but essential cautionary briefing we set to work establishing one of the most impressive places I have ever had the pleasure of calling “home”.